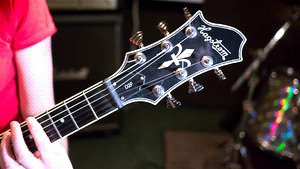 KitMonsters – Hagstrom D2F Deluxe. The music makers’ guide to making music. A high quality instrument, the D2F has a range of features that make it very playable. The alloy truss rod is strong and light, allowing for a very low action and a thin neck, whilst the exclusive fretboard is a homogenous wood composite with the sound of ebony, but with more reliability. This neck allows the notes to resonates well, and eliminates wolf tones. 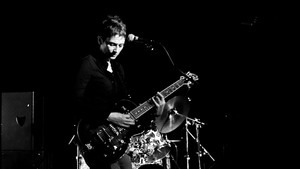 The bass side of the guitar is hollowed, with an f-hole which adds an extra resonance and warmth to the tone. The self-lubricating graphite nut improves the tuning stability, and the own-brand tuners have an 18:1 ratio, giving them a rock solid tuning. 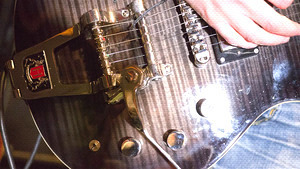 The roller bridge, and optional bigsby-style tremolo, all add to the stability, and when combined with the other features, make for a very reliable guitar. The two humbucking pickups have a coil tap feature, allowing the player to get single-coil tones in addition to the meatier ones available, and the scale length of 24.75 inches will feel familiar to Gibson players. 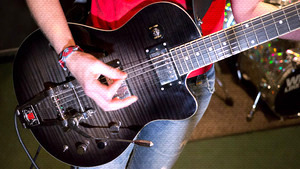 This is their most high-end guitar, with a very classy feel and a real attention to detail.